Comedies are often the hardest films to make, because you have to make sure that the script is air-tight with gags to carry itself all the way through, and that the director knows exactly how to pull it off on-screen with the right amount of comedic timing and actors who are game for any sort of physical humour they (or their stunt doubles) are being asked to do. More often than not, they really don’t work and you end up getting films like Life of the Party which fail so miserably at being comedic that the only laughs you’ll end up giving are out of pure desperation and frustration. This year, though, there have been a couple of notable exceptions; earlier this year, there was Game Night which benefited from a smart script that really took its audience and cast on a ride that was both highly entertaining and, of course, pretty damn funny; and now there’s Tag, which perhaps isn’t as smart as Game Night, but I will just admit upfront that I laughed way more at and had a bit more fun with. I’m not even joking, Tag is my current pick for the funniest film I’ve seen so far this year, as I don’t think I’ve laughed this hard at a film in quite some time, even more than Game Night which again I thought was very funny but somehow this one just got to me more, for many reasons which I am about to lay out for you. 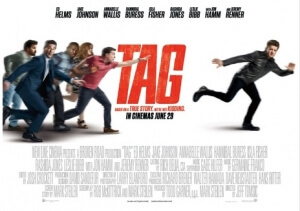 The premise centres around a group of friends – Hoagie (Ed Helms), Bob (Jon Hamm), Chilli (Jake Johnson), Kevin (Hannibal Buress) and Jerry (Jeremy Renner) – who, ever since they were children, have been playing the same game of tag every year during the month of May. For the current year, Hoagie recruits Bob, Chilli and Kevin, as well as his wife Anna (Isla Fisher) and Wall Street Journal reporter Rebecca (Annabelle Wallis), for a final attempt to get Jerry, who to this day has never been tagged, before he gets married and retires from the game altogether. However, their attempts are usually ill-fated, seeing as how Jerry is always five steps ahead of the others, and it’s going to require all of their brains and muscle to find a way to make Jerry “it” before it’s too late. Now, I know what you’re thinking: “wow, that sounds incredibly stupid, and this guy is a moron for thinking that this is the funniest film he’s seen all year.” Okay, you may not be thinking exactly that (I hope), but while it’s true that this is a very silly set-up that bathes itself in childishness, nearly everything about the execution of this movie, from the direction to the writing to the acting and beyond, is serious comedy gold. The lengths that some of these people will go just to tag someone – including, but not limited to, getting a low-end job at a player’s company so they can disguise themselves and get close to that person, and breaking into another person’s house at night – are extremely funny to witness, largely because it is directed like an action film, especially when they make attempts to get Jerry, which is where it uses the same type of slo-mo and voiceover from Guy Ritchie’s Sherlock Holmes movies to outstanding comedic effect. The levels of physical comedy here, as well as some of the lines that these actors come up with or are given to say, are just inspirational, and never fail to generate some huge belly laughs every single time. This is the kind of movie where so many laws are broken, and people sustain injuries that would at best seriously incapacitate someone, but none of that matters here because it is such a fun ride that it actively encourages you to forget all of that because you are having one hell of a good time watching this; plus, the idea that these men are doing so much of this stuff all for the purpose of making a single person “it” is absolutely hilarious. They also did a great job at getting actors who can easily give strong comedic performances, and even one or two that aren’t as well known for it. It goes without saying that Helms, Hamm, Johnson and Buress all have fantastic chemistry with each other, and they really do feel like friends that have known each other for many years and are just happy to be in each other’s company, even when doing some completely insane stuff all in the name of tag. They all have some really great comedic moments here, whether it be some seriously funny slapstick or just spurting out the most inane and off-kilter one-liners that hit way more than they miss, and they even find room to allow Isla Fisher to get some good laughs too, as Hoagie’s wife who is a little too obsessed with the game. As for Jeremy Renner, he’s always been a fantastic actor, but after seeing him in this comedy, not only being absolutely hilarious in how seriously he takes this game, but also in how he really sells his numerous action scenes by just being so damn cool about it, that belief is only solidified. The obvious joke would be to remark about how this was what Hawkeye was up to during the events of Avengers: Infinity War, but since that’s probably been done to death on the internet I will just say that this is an unexpected calling card for him to appear in more action movies, in addition to more comedies period. Oh, and if you’re wondering about that whole thing with Renner’s arms being CGI’d due to injuries, you really shouldn’t, because it’s barely noticeable and besides, you’re having a good enough time to even try and spot it. Amidst all the hilarious carnage, it is a film with heart, and you can really feel that in the comradery between these characters, and especially towards a concluding set of emotional scenes that are surprisingly well portrayed and don’t kill the tone entirely, adding another level of genuine warmth to it. This is cemented by end-credits footage of the real-life group of friends this movie was based on, who really do play an extended game of tag with each other and adopt many of the methods that are used and amped up for comedy in this film. This film works as a loving tribute to not only those guys, but anyone who was friends with people from school and still are well into adulthood, which makes it a heartfelt movie about friendship in addition to it being one hell of a funny comedy. Take it from me, if you’re after an absolutely hilarious ride this summer, then Tag is most definitely “it”. Tag is an early contender for the funniest film of the year, containing hilarious comedy of all sorts left and right, and held together by a strong comedic ensemble and a strong beating heart to it that puts it above many of the other comedies so far in 2018.